The RAFT strategy (Santa, 1988) helps to guide students’ writing. Often times when we give our students a writing assignment, we give them a vague topic such as “My Biggest Accomplishment,” and some students have trouble knowing where to begin. A RAFT breaks down the writing activity to make it more manageable for students. It can be used in any subject area and is a great way to incorporate writing across the curriculum. 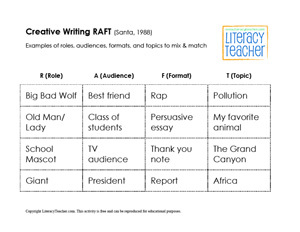 Here is a fun creative writing activity that incorporates the RAFT Writing Strategy! Have 4 containers, each labeled for one of the 4 letters in RAFT. Fill the containers with various roles, audiences, formats, and topics. Have individual students or groups choose randomly from each container to come up with a creative writing activity. Here are some examples of roles, audiences, formats, and topics to mix and match for your students– ready to be cut out!